« LG VX11000 – Voyager 2 on the Horizon? Krispy Kreme vs. Dunkin’ Donuts – O Showdown! 1 – Hot Now -Original Glazed Doughnuts – Nothing is better, nothing else even comes close! Tagged Doughnut, Dunkin' Donuts, Krispy Kreme. Bookmark the permalink. Krispy Kreme has the best donuts, but Dunkin' easily beats them with their coffee. FROM COLUMBUS, OHIO——-The topic for consideration is Hamentaschen, dessert food for the Jewish holiday Purim. This request has a date in 2009, Tuesday, March 10. For sale at a doughnut shop, the use of ingredients excluding forbidden nonkosher food like lard might be recommended. However, the Reform Rabbinical groups might give advice that use of pork products obtained under authorized supervision is allowed. Once a year, these pastries might be something special that would be popular. Please consider the suggestion that your provision of these pastries might be based on agreement that any left overs that are considered day old could go to an outlet bread and cookie store if they approve of their packaging. Pepperidge Farm in the Kenny Center, Columbus, Ohio has sold large heavy cardboard trays of pastries, no Hamentaschen.yet. Very nice tips. Thanks for sharing! I'm in Arizona, we used to have Krispy Kreme but no longer do…. 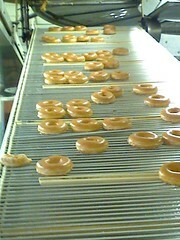 =( I miss taking the kids down to the Krispy Kreme every once in a while and watch their eyes light up. They like Dunkin' Doughnuts, but it's not the same. When i want a doughnut i'll get a glazed KK. If I want a cup cake with a hole in it and a great coffee, I'll hit the nearest DD! I have no time for Starbucks, the “Hot Topic” of fat francheezy spots. Just wanted to commend the writer of this piece before I click the links and forget!